India may soon get its first fully-foreign owned airline after the Modi government allowed 100% FDI in the sector last June. Qatar Airways CEO Akbar Al Baker said in Berlin Wednesday that he plans to start an airline in India with the investment arm of Qatar government. A Qatar Airways spokesperson quoted the CEO saying that since India now allows 100% FDI, he plans to do so with Qatar Investment Authority. Baker also said that he will be making an application to launch a domestic airline in India soon. Qatar Airways has for many years been eyeing a stake in IndiGo but the Indian budget carrier has not done so. Last June, the Modi government had allowed Indian carriers to be fully owned by foreign entities. While foreign carriers will still be required to have up to 49% stake in airlines here, they can now get a foreign partner — like a sovereign wealth fund or an institutional investor — and not look for an Indian partner to put in the remaining 51%. However, India is yet to review the issue of "substantial ownership and effective control (SOEC)" in the fully-foreign owned airlines it had allowed last June. Currently, flying licences are given to an airline in India only if its chairperson and two-third of the directors are Indians and if the SOEC is with Indian nationals. The issue of SOEC being with Indians arises at two times -- issuing the operating licence and giving bilateral rights that India has to its airlines for flying abroad. The requirement of SOEC is also a condition from International Civil Aviation Organisation (ICAO) regarding bilateral rights. Which means if an Indian airline has more than 49% foreign ownership, then there may be an issue in getting the bilateral rights for flying abroad. But there will be no bar on flying within India. At present, only three Indian carriers have investment by foreign airlines. Abu Dhabi's Etihad has a 24% stake in Jet Airways. Tata Group holds 51% stake in Vistara and AirAsia India each, with Singapore Airlines and AirAsia Berhad having the remaining 49% in them respectively. I'm sure we'll all read about it on your blog. I feel like the 100% rule is meant to mean one 49% foreign partner and then the rest can be publicly traded and owned by foreigners. Not a loophole way for a foreign airline to control a carrier. I think this airline should count towards Qatar's bilateral. Also I would rather a current indian carrier join one world and start expanding abroad. India needs more nonstop connectivity to the world. Transiting through DOH, AUH, DXB is not a viable long term option for a country as big as india. Its time the GOI puts in place rules that facilitate this. The ME3 should be grateful for the seats they already had. If planes are full to the ME, then great raise fares. At least Indian carriers can grow then. That said, I think the ME3 will start to shift seats back to O&D if seats really get tight (and I think only DXB comes close to Indian carriers even maxing out). So there is still a ton of room to grow capacity to the ME by indian carriers. Qatar Airways' plan to set up a 100% Qatari-owned domestic airline in India is all set to get a red carpet treatment from the Modi government, but 'old' Indian carriers are gearing up to oppose the proposal tooth and nail. Aviation minister Jayant Sinha told TOI on Thursday that India now has among the most liberal FDI regimes in the world for the aviation sector. "Qatar and other airlines are very welcome to explore how they can establish themselves in India under that FDI regime. Under our regulations, it is possible to have a 100% foreign-owned carrier in India," he said. India since last June, allows 100% foreign-owned domestic carrier, in which a foreign airline can have up to 49% stake and foreign investment arm/s the remaining 51%. The Federation of Indian Airlines (FIA), comprising Jet Airways, IndiGo, SpiceJet and GoAir, is planning to oppose Qatar Airways' (QA's) Indian plan on the ground that no country allows 100% foreign-owned domestic carriers. "Indian carriers cannot own or control airlines in other countries. It will be a complete sellout of Indian interests as it hurts desi airlines and will lead to setting up of another hub for Indian traffic abroad (referring to the QA base of Doha). It is a complete reversal of 'Make in India'," said an FIA member. FIA had used the same argument to oppose Singapore Airlines and AirAsia's JV airlines with the Tata Group in India. It says that FDI in airlines was allowed to ensure that existing Indian carriers get much-required funds and expertise and not for JV startups. The government, however, dismisses this view. "We have to distinguish between investment and operation. The investment and carrier may be 100% foreign, but the airline will be 100% Indian in terms of giving jobs, operations and expenditure. It will benefit Indian economy tremendously if we have investment in more airlines. Anyway, all required security clearances will have to be obtained before it can fly," Sinha said. He made a strong pitch for foreign investment, saying India's aviation market is still under-penetrated and more investment is needed to make flying more common by making it more affordable. India last year saw 10 crore single domestic trips and 5 crore single international trips (a return journey counted as two as that person took two flights). "We have a middle class of 30 crore and in the long term our aviation market will grow at 12% to 13%. India very easily has the potential of having 40-50 crore air trips annually (up from 2016's 15 crore) and be the size of China's aviation market, as our GDP grows. We have tremendous potential for growth. 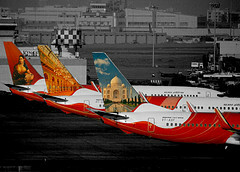 Our aviation market is set to double and triple," Sinha, a former junior finance minister, said. Qatar Airways' proposed full service airline in India is likely to set up its base in Bengaluru and provide connectivity from there to other parts of the country. At present, budget carrier AirAsia India, which is a joint venture between Malaysia's AirAsia group and India's Tata Sons, is the only local carrier which has its operational base in Bengaluru. Akbar Al Baker, Chief Executive Officer of the Doha-based full service carrier, had last month announced in Berlin that Qatar Airways was going to join hands with the investment arm of State of Qatar to start a domestic airline in India with a 100 per cent investment. "Qatar Airways proposed Indian subsidiary is likely to make Bengaluru as its base instead of Delhi or Mumbai," an industry source said. Qatar Airways, which is among the top three Gulf carriers, has been exploring investment opportunities in India. The source also said that the new airline is expected provide connectivity first from the southern India cities to other parts of the country and then expand to other regions. Significantly, six cities of the total 13 that Qatar Airways flies to in India are in the South. A Qatar Airways spokesperson, in an e-mail response to PTI queries, declined to comment on the issue. "We cannot comment anything at this stage," the spokesperson said. Though Qatar Airways is yet to apply for government's permission for setting up a domestic airline here, it has already started giving shape to its plans with the appointment of a local headhunter to hire fresh talent as well as professionals from the existing domestic carriers. Significantly, the Persian Gulf carrier has been eyeing the fast growing domestic air passenger market, which became the third largest, beating Japan, after the US and China in 2016. "We are doing this (setting up a domestic airline in India) because Indian government has opened up the foreign direct investment in (setting up) an airline in India," Al-baker had said on March 8. On several occasions earlier, the Qatar Airways -- which operates a significant number of flights from India to Qatar's capital city Doha -- had explored the possibility of buying stake in Indian budget carrier IndiGo. Last June, India allowed foreign investors -- barring overseas airlines -- to own up to 100 per cent stake in local carriers by liberalising FDI regulations. Currently, foreign airlines are allowed to invest only up to 49 per cent in Indian carriers. However, the revised norms provide room for overseas airlines to partner with a foreign non-airline player to set up a 100 per cent foreign-owned carrier in India. I suspect the repeat of global phenomena. New entrant with deep pocket enters.. price wars.. industry shakeup and those with better planning and strategy survive. Middle Eastern airlines definitely did a great job in bringing connectivity to all parts of the world from India, even from smaller airports. But now they are starting to throw their weight around, and Indian aviation authorities need to cut them to size. It would be good if one of the existing Indian airlines becomes a partner of Qatar Airlines. I have been saying this for sometime now. We already have too many airlines in India. Allowing more airlines will only make things much worse for everyone. Indian authorities need to take swift action to nip this in the bud. Agree with both Caliguy and PlaneLover. India has far too many airlines chasing the same routes. Just recently, Air Carnival another regional carrier was grounded (after Air Costa, Pegasus before that). India especially has too many airlines in the south in particular. Most of the routes introduced by the regionals are also covered by the existing bigger carriers. Indigo, Spicejet, Vistara have placed orders or many more aircraft. I am wondering where they will deploy these aircraft. India should put a stop to any investment by QR. QR can invest in existing airlines if they wish but not start something new. The Government of India should give unconditional permission to anyone who wants to start an airline. If the airlines go bust, it is entirely the fault of their management. People who start airlines for no other reason than to massage their egos will fail. The smarter ones who know the market will succeed and thrive. If Qatar, or anyone else for that matter, wants to start an airline in India, they will be doing so at their own risk with their own investment. If they have the brains to succeed then they should be allowed to. If not, they too will go bust. It is for the Indian customer to choose which airline he/she wants to fly, and for the Indian market to decide who stays and who goes bust. It is not for the government to decide who should or should not be running airlines in India. That is what capitalism is all about. The fittest and smartest will survive, while the clueless moneybags will fail. It is funny to hear Indian beneficiaries of American capitalism like @iah87 and @Caliguy pontificate about the need to bring governmental control of the airline industry in India. Such restrictions are as communist as they come, and belong more to the dustbin of history than to a corporate boardroom. Fed up of capitalism people? Move to Cuba while it still practices communism. Wow just wow. Free trade still has to be fair trade. The ME3 has used every trick in the book to stunt Indian aviation (meaning predatory tactics). That is not capitalism. Aviation has tremendously benefited DXB, DOH, etc. India needs a strong aviation sector and not just cheap seats. No country is in favor of dumping seats and having their aviation sector in a constant state of disarray. Every time Indian carriers start to grow the ME3 gets a massive bilateral increase. The funny thing is, I think India's growth is finally pushing the airlines to increase nonstop connectivity. Plus the laptop ban and many Indians reluctance to fly through the ME is helping. The mistake with the EY 9W deal was that it allowed EY to bypass their bilateral. If Qatar wants to invest in an airline, fine. The airline should only be allowed to fly to DOH under Qatar's bilateral. India needs more seats to DOH like it needs more slums in cities. Btw I think 9W's partnership with KL/AF/DL has done more for their international growth then EY ever did. Also AI joining Star has helped them a lot as well. Wow just wow. Free trade still has to be fair trade. The ME3 has used every trick in the book to stunt Indian aviation (meaning predatory tactics). That is not capitalism. Aviation has tremendously benefited DXB, DOH, etc. And why have the ME3 been so successful? Because Indian travellers have been flying them happily, predatory tactics or not..
And why have Indian travellers been flying the ME3 happily? Because the ME3 have shown greater understanding of India's market and have provided Indian customers with good value. Rather unlike a very Indian airline which till recently, had to almost be reminded that there were airports besides Delhi and Mumbai in India. It is a matter of national shame that people based in Dubai and Dusseldorf know more about the Indian customer 's needs than some so-called Indians based in Delhi. And if the National Myopia wasn't enough, we have had our own people like the assorted Mallyas, Thiagarajans and Gopinaths, who entered the industry to satisfy their own hubris. They went bust and very nearly took the reputation of the industry with them. AI and 9W may have made amends by joining Star and partnering with AF/KL respectively, but the fact remains that EK alone carries more Indians out of India than AI or 9W do. And this has lots to do with the quality of service and customer care, and the fact that Indians have matured enough to vote with their wallets. It is only free trade that has allowed the Indian customer to become so powerful. Bring on more competition I say. Comparing international traffic to domestic traffic is not the same. ME3 provided markets for international not domestic. You talk about capitalism. The US is one of most capitalist economies in the world, but allows only 25% investment in its airlines. The fact is there are more than enough airlines in India now to serve the domestic market. Do you honestly think we need more upheaval in the airline sector, when an airline struggles and ultimately goes bankrupt it disrupts many passengers. India has reached a stage where the domestic airline market is mature now, prices are low (in fact often below break even levels) and connections are there for many cities. QR can easily invest in an existing airline (Spice Jet or Go Air).